Treats are a delicious part of life but of course ‘treats’ have been bastardised by many food companies to include horrible combinations of harmful chemicals, high sugar and salt, petroleum based food colourings, fake flavours, flavour enhancers, highly processed vegetable oils and more. That’s where home made chocolate caramel popcorn comes in. 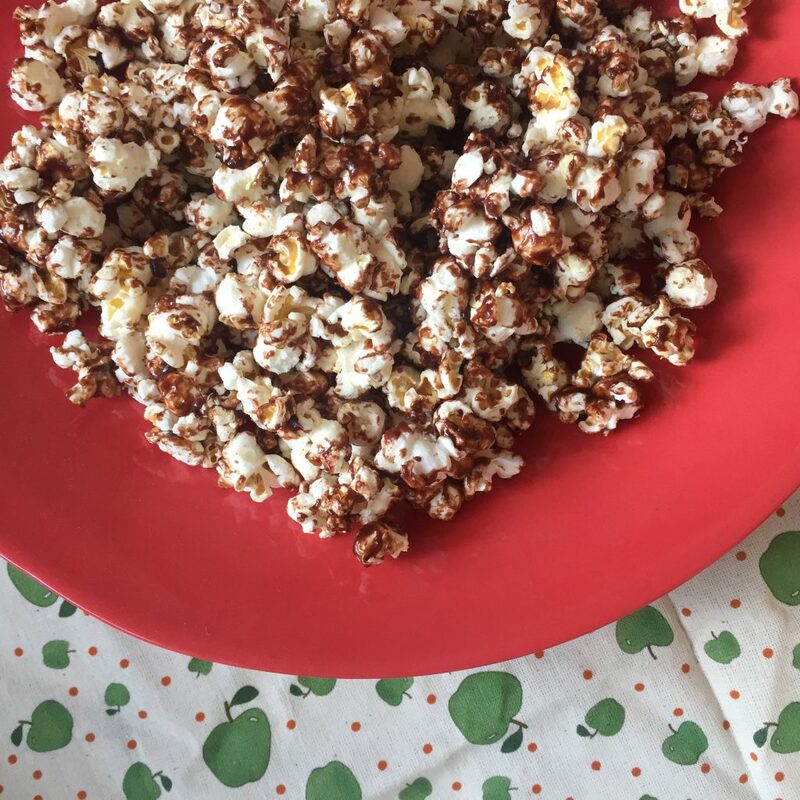 When you buy a chocolate and or caramel popcorn in the shops it is always either fully coated in high sugar chocolate or packed with thick layer of sugary caramel. I’ve created this recipe to show that a hint of sugar and chocolate is all you need to add for a delicious treat. This is a great one to whip out at the party table or for a play date or movie sleep over. It’s also a good one for the parents when the kids aren’t watching. I’ll leave that suggestion right there. Enjoy the popcorn – tag me at @lowtoxlife on instagram when you make it. No doubt your pics will be better than my quick ones! 2 tbsp melted butter FOR EXTRA DECADENT VIBES: Double the butter, syrup and salt to make the caramel. Heat your oil in a medium saucepan with a lid, until super hot. 2 minutes. Add your popcorn and toss it about for a couple of seconds to ensure you’ve coated the kernels in the oil. Let the popcorn pop for a couple of minutes and turn off the heat as soon as it slows to 1 popping kernel a second. As soon as you’ve popped the popcorn in the pan, you can get a frying pan going with the melted butter, syrup and salt. Once it’s bubbling well, it’s probably time to turn the popcorn off. Then add your cocoa to the butter / syrup pan and stir through until well mixed through. Now get two spoons ready and a big bowl. 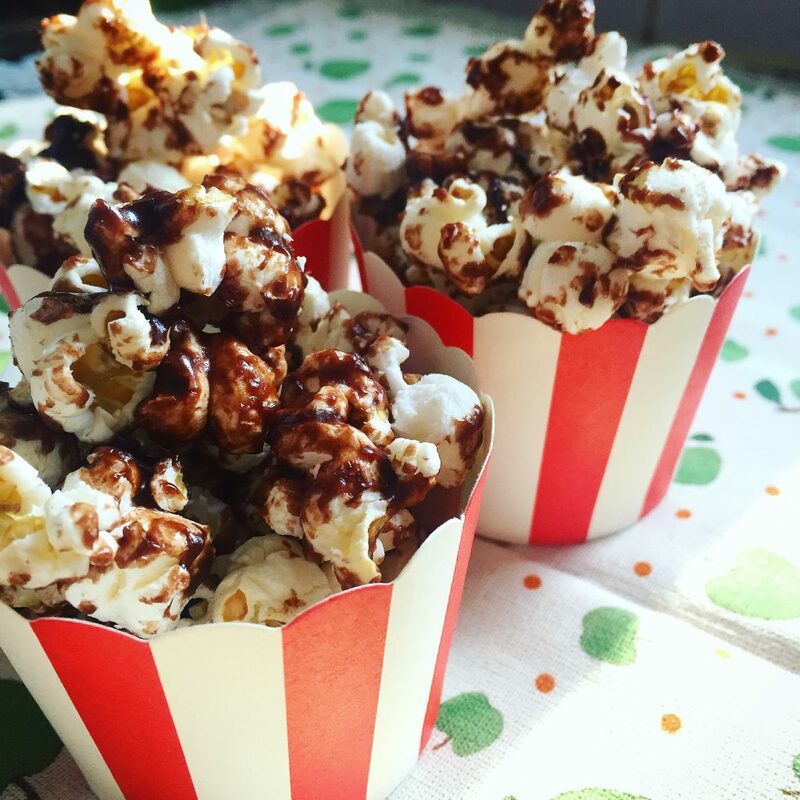 Put the popped corn in a bowl and then quickly pour the chocolate caramel over it. You have to work FAST. Voila. You’re done. Pop into little cups for parties or playdate snack plates with veggies, dips and a little cup of the popcorn OR serve from the bowl – however you do it, most importantly of all, enjoy! Holy cow … I’m needing a snack for the kids for a car trip this arvo, and this will make me mum.of.the.week!! Thank you – looks fantastic!! Can I use the organic popcorn that’s already made (and not kernels)? Or does it need to be fresh and warm?? You sure can – short cut central 😉 Enjoy! I make this for the kids, ate it for me – YUM! Will be keeping this recipe on file for sure!! Thanks so much for sharing and hope your little ones popcorn stall went well. Hi Alex, for selling these were all ingredients added into the bag with the kernels? Where did you purchase the bags? I’m curious about using this idea for a school fundraiser.